I'm sure many readers will remember playing card games like this one, particularly if you live in Europe. There were variations on the theme but cars were the main one. You competed with a friend or friends to see who could win each round by trumping the others' cards with more horsepower or top speed or price, etc. 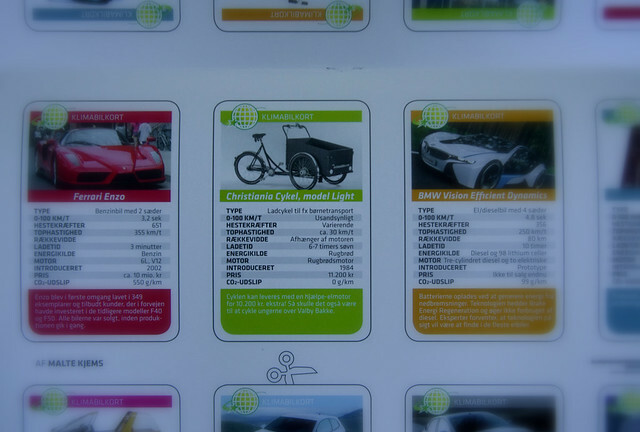 The City of Copenhagen (if I recall correctly) included a set of updated cars in 2009, included in a magazine and called Climate Car Cards. The theme was winning each round with the most environmentally friendly vehicle. A Christiania Bike was featured on one of the cards. It must have the win-all card.